I'm wondering whether the children of today actually know what a radio is, and moreso what a radio station happens to be. In an era of Spotify and Netflix, the traditional methods of broadcasting are slowly dying. In fact one of Australia's television stations has gone into voluntary administration and has since been purchased by CBS. While TVs are struggling to survive, I sometimes completely forget that radio even exists, and sometimes I am surprised to hear that it actually still survives. While video didn't necessarily kill the radio star, they fact that I can jump onto Spotify and listen to what I want to when I want to really changes everything. Yet I grew up listening to the radio. I still remember when we would sit in the lounge room with the radio on and a tape in the cassette deck waiting for a song to come on, and if it was one of our favourites, then record it. Okay, that changed a little when I had enough money to purchase records and tapes (and later CDs), but right up until I finished university and started my first (and so far only) full time job I would wake up to the news blaring out of my bedside clock radio. Not quite a clock radio, but you get the picture. 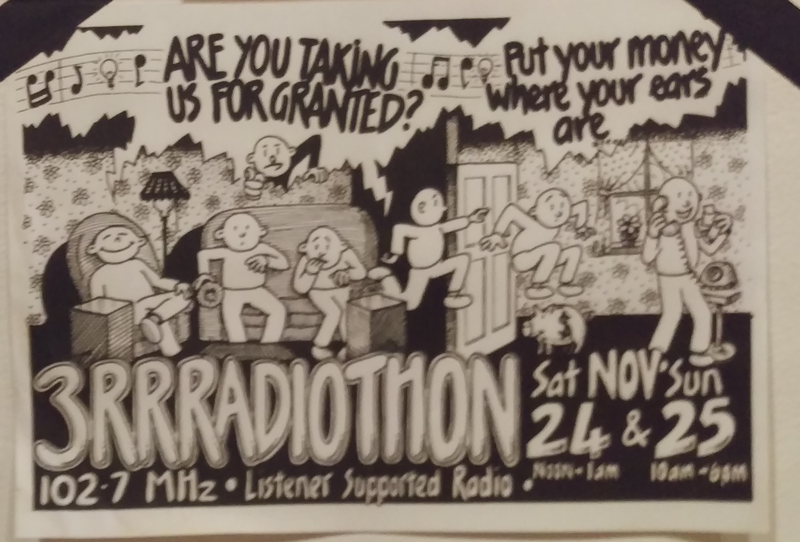 Anyway, the reason this post came up is because the State Library of Victoria has these free exhibitions in one of their rooms, and this year it was on the community radio station RRR. Mind you, having not grown up in Melbourne, and in fact having only been here for five years (and never having listened to any radio while I've been here as well), I'm not at all familiar with the commercial radio stations, let alone a small community radio stations. As such, I'm probably not a huge expert on this, nor overtly sentimental either, yet the exhibition itself was still quite interesting. Community radio differs from mainstream radio in that they are independent and not beholden to corporate interests. Most of my young years were spend listening to one of the two 'rock' stations in Adelaide - 5KA (on the AM dial, but they later moved to the FM dial and became KAFM) and SAFM. I started off with 5KA but I remember friends telling me that SAFM was much better so I ended up switching over to them. Later I would listen to the local Christian radio station, and in particular their heavy metal hour. At university I ended up switching over to Triple J, which was a national, government funded, broadcaster. 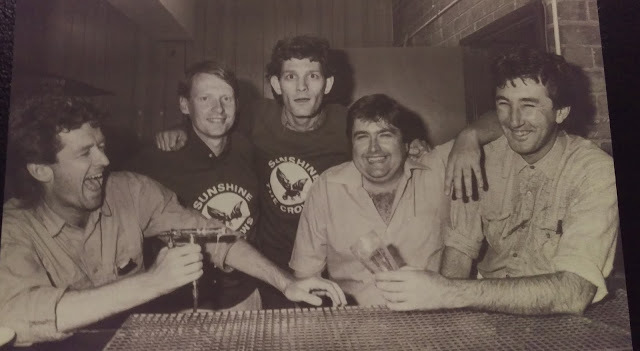 Triple R appears in 1976 after a broadcasting license was issued by the then Whitlam Government who was interested in developing Australian culture. The radio station started on the RMIT (Royal Melbourne Institute of Technology) campus, but quickly outgrew it's premises. The station itself has been funded mainly by sponsorship and subscribership. Over the time the station has faced financial crises, threats of closure, and corporate takeover, all of which have been overcome. However, I do wonder whether the rise of the internet, and the population's movement online is going to keep it going. One of the first initiatives of the station was to publish a monthly magazine - Radio City. The magazine would talk about the daily happenings at the station, as well as information on other activities, including benefit concerts. Further, unlike the station itself, the magazine was permitted to carry advertising. However, after 27 issues the magazine was ceased, due to financial problems. The radio station, being a community radio station, doesn't have much in the way of paid staff. In fact many of the people who work at the station are volunteers. I remember back in university a couple of friends managed to score a spot on the university radio station (though I have to admit that I never listened to them). As for RRR, this is also the case, but like with a lot of stations, many of the presenters actually develop a loyal following, which does help. 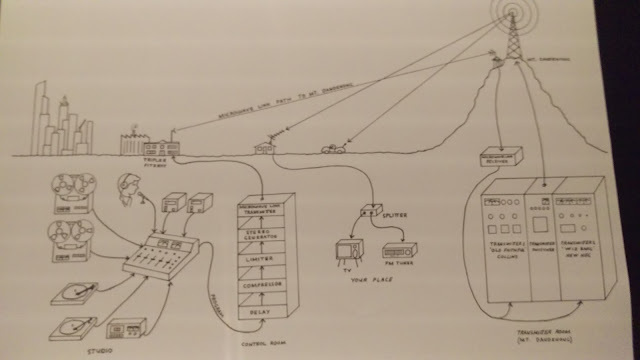 The purpose of the radio station was basically not to be like the other, commercial stations, but instead to provide educational content (which is not surprising considering the university origins). Mind you, having a radio station where you actively listen to it rather than have it playing in the background isn't really the style of radio station that works. People actively watch television, but the radio is generally background noise. Yet this has worked, and RRR has survived and flourished. The question is raised as to whether they played music, and the short answer is yes. The question I guess then is what style. Well, looking at some of the play lists it certainly seems to be rock, and also more alternative (Jane's Addiction, Jesus & Mary Chain, the Ramones - gee, these bands go back a while). Yet, the term 'Alternative Rock' didn't really come up until the nineties. During the 80s I there didn't seem to be an 'alternate' rock scene. Well, there was, but that tended to consist of bands such as Metallica, Megadeth, and Iron Maiden. Yet this was heavy metal, and it tended to have a limited following, and certainly not one to justify a radio station if its own (though they did have 'heavy metal hours' on some). One experiment they did try was easy listening over the summer months. The music style has always been eclectic and diverse, though at first it had a punk leaning (and this was back in the 70s). However, the station has always had a focus on local and the alternative music scene. There is no set play list, which means that the presenters are free to play whatever music they like, and to also generate a discussion around music. The one thing that brings all of the presenters together is their love of music, whether they be musos themselves, or are simply passionate about music. In fact many of their subscribers came about by turning the dial and suddenly discovering that there was a station that played their style of music. Another thing about RRR was that they would look for up and coming bands, usually by scouring the pub scene, and bring them into the studio. They weren't the only station to do that - Triple J also did a similar thing with their unearthed series (and it seems as if Triple J was based on the model established by RRR). However this is something that commercial stations didn't do - if you wanted airplay on them you had to have already been successful. In fact many well known Australian bands found their fame through RRR. Though, the suggestion that these stations scour the pubs for unknown bands is a requirement to play a certain amount of Australian, and local, music. 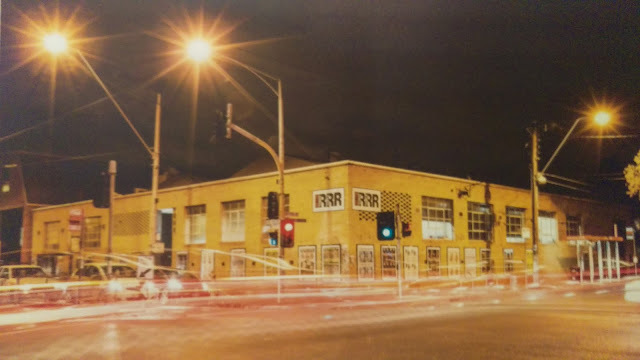 For most of it's life, RRR worked out of leased premises. This can be rather problematic, particularly when the owner decides that they no longer want a radio station on their premises, or they sell the building to developers. RRR moved a couple of times, but after learning that there last lease was not going to be renewed they decided that they would run a fundraising event to purchase a property. This they managed to do, and bought an old lingere factory which now houses their offices and production studios. An exhibition on a radio station isn't going to be an exhibition is it doesn't actually show you how they work. The centre of the production is the mixer, one of those big machines with lots of buttons, knobs, and levers. The various sounds are fed into the mixer, which is then passed through the system to be sent as a signal up to the broadcasting tower. These towers are usually high up (and in Melbourne that is Mt Dandenong), and then broadcast out across the suburbs to the home and cars. Interestingly some homes had splitters, due to the antennas picking up both television and radio signals. However, my radios all had their own antennas. As for presenting (or DJing, as the lingo goes), Tony Biggs, who started off in Brisbane, moved to Sydney to present at Triple J, and then found himself as a presenter in Melbourne, describes the art of being able to string a number of songs together so that the listeners feel engaged. However, talking is also a key element in it. Mind you, the art of being a talk back presenter seems to be able to simply spew out rubbish for the length of your show. Yet you can't just say anything because you need to engage the audience. If the audience doesn't like what you are saying then it doesn't matter what tunes you play, they are simply going to tune out (in the literal sense). Of course they also have a sporting section, and when it comes to sport, at least in Australia, then you have the larikins. This is the route that RRR took. A lot of sporting content tends to be quite bland and boring. Mind you, my Mum still listens to the football on the radio - she rarely, if ever, watches it on television. My uncle is the same, suggesting that he grew up listening to the matches on the radio, and it just come second nature to them. As for me, well, I need to watch it on television, and when it comes to commentators, I generally turn the volume down. As for RRR, well, their segment is quite outlandish and irreverant, which adds a greater dimension to it. Another thing that RRR does is be involved in the community. One thing that they stage is an annual community football match, which is used to raise funds to support sport and arts for the disadvantaged. Not only is there a football match, but there are also other events, including music. Then there is the parade down Fitzroy Street during the Melbourne Fringe, something that I haven't been aware of as yet, and probably should get around to checking out the next time it comes around (and I've probably missed that this year).